TULSA, Okla. -- Two Oklahoma brothers charged with fatally stabbing their parents and three of their younger siblings in a middle-of-the-night rampage can stand trial on first-degree murder charges, a judge decided Tuesday. Detectives testified the massacre was part of a plot to carry out more mass killings and that the boys wanted to gain notoriety and outdo perpetrators of mass shootings. Special Judge Martha Rupp Carter said there's enough evidence for 19-year-old Robert Bever and 17-year-old Michael Bever to be tried. The Bevers both have pleaded not guilty in the July killings of their parents, David Bever, 52, and April Bever, 44, and their siblings Daniel Bever, 12, Christopher Bever, 7, and Victoria Bever, 5. Two siblings survived. Detectives who testified during a hearing Tuesday said the brothers detailed to officers a gruesome plot to carry out further mass killings. 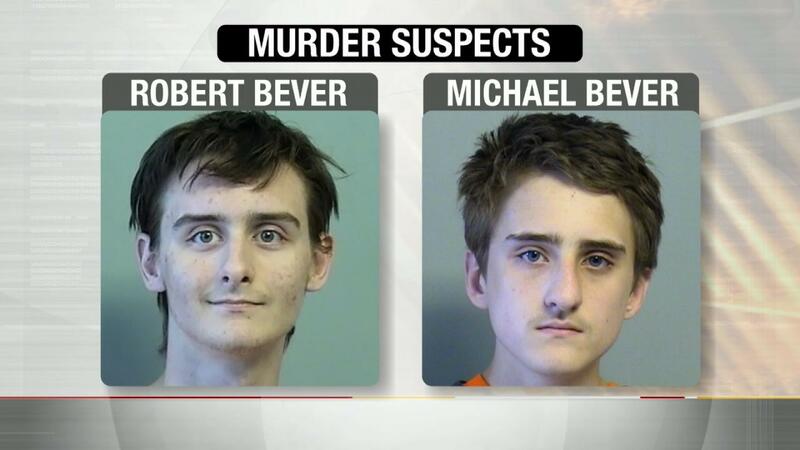 Detective Eric Bentz of the Broken Arrow Police Department said Robert Bever expressed a desire for notoriety for being a serial killer. Bentz said the teen told of a plan to kill their family, cut up the bodies, and store them in bins in the attic before taking the family vehicle as well as guns and ammunition to randomly attack other locations and kill 10 people at each place. "They wanted to kill at least 50 people, they wanted to be famous. They wanted a Wikipedia page. They wanted media coverage," said Detective Rhianna Russell, who had interviewed Michael Bever. She said he indicated that they wanted to outdo known killers, and had mentioned the Columbine school and Aurora movie theater killings in Colorado in particular. Authorities had previously said the brothers conspired to kill their family and that one brother had kept plans for a "mass homicide" stored on a computer drive inside the home, but had not before given details. Autopsy reports show the family members were stabbed dozens of times and died of multiple, sharp-force injuries. David Bever had at least 28 total wounds and April Bever had at least 48. Bentz testified that Robert Bever lamented that the plan didn't go as it was supposed to and "everyone didn't die like they were supposed to." After the bodies were discovered at the family's home in the Tulsa suburb of Broken Arrow, a police dog tracked the two teens, then 16 and 18, into a wooded area behind the house. Bentz said Robert Bever talked about a plan to make two videos - one showing the bodies that they believed would only be seen by police and prosecutors, as well as another version without the bodies that could be posted online. "If he killed one person he was one person, that evened it out," Bentz said the teen indicated, while "if he killed one more than one person, that would make him like a god." In addition to the electronic device, investigators removed from the home knives, swords, machetes, cellphones, gloves, darts, a black mask, an atlas, computers, Kevlar knit sleeves and wireless cameras, according to police affidavits. By many neighbors' accounts, the Bevers kept to themselves - the siblings played alone in the backyard, walked down neighborhood streets bunched together and their parents didn't socialize much. David Bever's former co-workers at a local IT department described him as a quiet man. A judge earlier had rejected Michael Bever's request to be tried as a juvenile. Prosecutors haven't decided whether to seek the death penalty against Robert Bever. The judge set arraignment for Feb. 29 in Tulsa County District Court.